Collars are classified as band, high-stand, or low-stand collars. 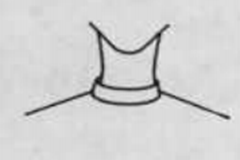 Within each of these classifications are a variety of styles defined by the shape of the collar’s outer edge. These collar terms are often used in Ivy and Pearl Boutique apparel product descriptions, prompting questions from our customers. 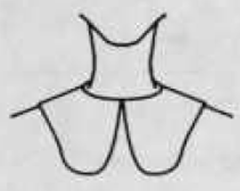 Band collars have a straight or convex neckline edge. An ascot collar is a long, medium-wide to wide band collar with two ends brought to the front and looped over each other. 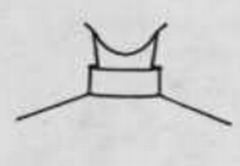 The ends may be an extension of the collar or may be attached at the back of the collar. 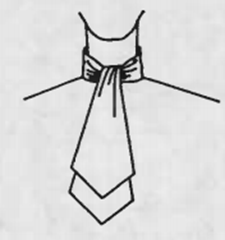 Ascot collars are also referred to as stock-tie or flit-tie collars. 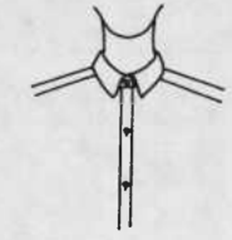 A basic band collar is a straight or slightly curved collar cut on straight yarn direction or bias. It may fasten in the front or the back. It is sometimes referred to as a stand-up collar. A bow collar is a long extension of a wide band collar that is tied into a bow. 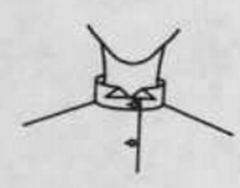 A Chinese collar is a short unfolded band collar with square or rounded ends that do not quite meet at the front. This collar starts at the neckline and rises vertically about 1 inch. It is also referred to as a Mandarin or Nehru collar. A choker collar is a wide, high band, close fitting collar that fastens in the back. 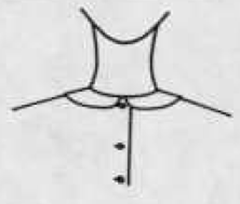 Also referred to as a Victorian collar. 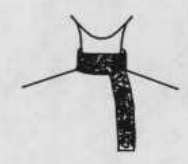 A clerical collar is a stiff white band collar that fastens in the back. A white collar may be partially covered by a black or colored collar called a rabat. A clerical collar is sometimes referred to as a Roman collar. A Cossack collar is a high-standing wide band color that fastens on the left side. It is frequently trimmed with embroidery. Also referred to as a Zhivago or Russian collar. 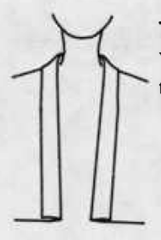 A cowl collar is a wide bias-cut draped collar. They may be made of knitted fabric like a wider and deeper variation of the turtleneck which drapes in soft folds. 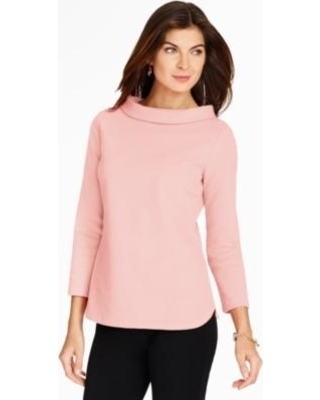 A crew collar is a high rounded neckline finished with a narrow strip of rib knit. 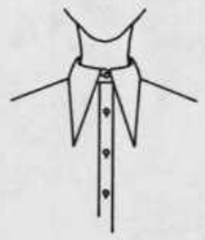 A funnel collar is a large, wide collar variation which stands away from the neck and face. They typically open in the front. A medic collar is a narrow band collar that fastens on the right side. 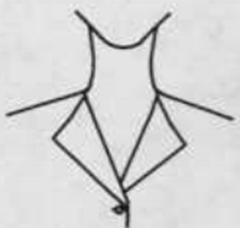 They are sometimes referred to as a Ben Casey collar. A mock-turtle collar is a high, rounded neckline finished with a medium-wide strip of rib knit material. It resembles a turtleneck but with a soft fold at its top. Also called a mock polo neck. A portrait collar is a band collar located farther away from the base of the neck than the ring collar. A ring collar is a type of band collar on a wide neckline. 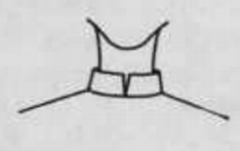 Often referred to as a moat or wedding-band collar. 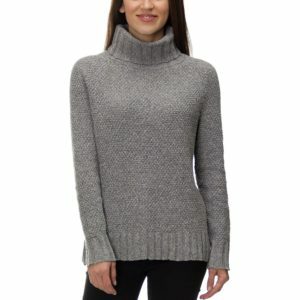 A turtleneck collar is a close-fitting, high, rounded neckline finished with a very wide strip of rib knit that is often worn folder over. 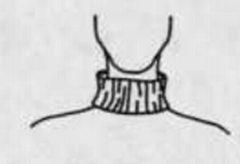 Also called a polo neck collar or roll-neck collar. A wing collar is a heavily starched, stiff, short band collar with pointed tips that fold outward pointing horizontally. 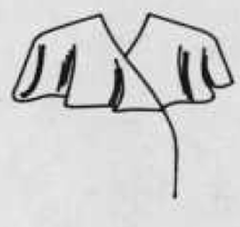 The collar resembles a wing, hence the name. 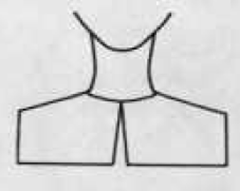 High stand collars have a straight or slightly convex neckline shape. 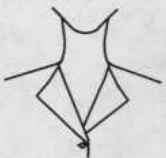 The largest portion of the collar stands above the base of the neck. They are also referred to as rolled or turned down collars. 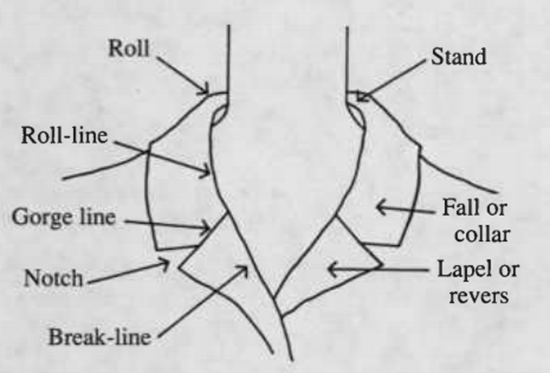 Below is a diagram illustrating the various parts of the collar. A Barrymore collar is a two-piece turnover-shirt collar with 4 to 5-inch long points in front. This style was made famous by actor John Barrymore. 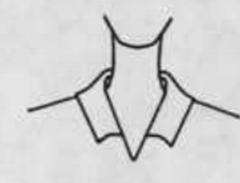 It is sometimes called a tapered collar. A Buster Brown collar is a two-piece high-stand collar. They are medium sized with rounded front edges. They are usually white and worn with a colored bow. 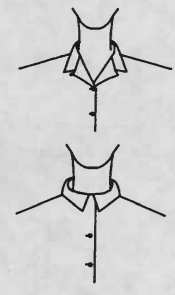 A button-down collar is a two-piece collar with buttonholes in the ends of the collar allowing it to be fastened to the shirt via small buttons. A Chelsea collar is a one-piece medium-wide collar with square, pointed ends attached to a front opening V neckline. A cloverleaf collar is a type of one-piece lapel collar with rounded corners on the lapel and collar. 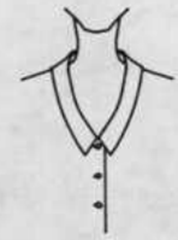 A convertible collar is a one-piece high collar which can be worn open or closed. 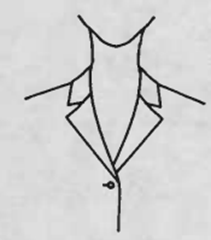 Lapels are formed when worn open. 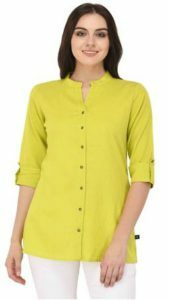 A Johnny collar is a very small, round or pointed one-piece high stand collar that has a front split and is attached to a V neckline. They are usually a single-layer knitted collar that fits close to the neck. 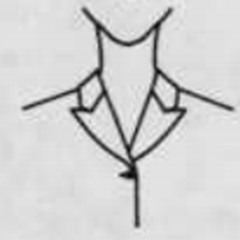 A lapel or rever collar faces the front of the garment which folds back to show. Lapel types include notched, cloverleaf, and peaked lapels. 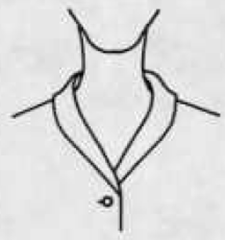 A notched collar is a one-piece tailored collar used for suits. There collar has a notch where the collar ends and joins the lapel that creates a step effect. 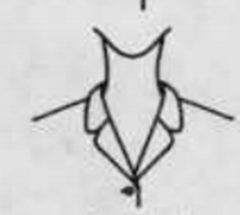 Also called a notched lapel collar. A peaked collar is a type of lapel color with sharp points on the lapel, often found on double-breasted jackets and occasionally on sing-breasted suits (the ability to cut peak lapels properly on a single-breasted jacket is one of the most challenging tailoring tasks). Also called a peak lapel or pointed lapel. 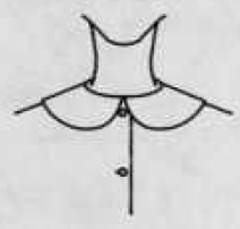 A pin collar is a two-piece high-stand collar with eyelets through which a collar pin is inserted. A spread collar is a two-piece high stand collar with wide spacing between the ends of the collar. A swallow-tailed collar is a two-piece collar with extremely long, narrow pointed ends. 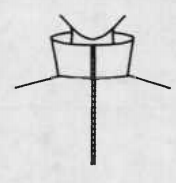 A tab collar is a two-piece high stand collar with a small strap that buttons or snaps to the other side of the space between the ends of the collar. 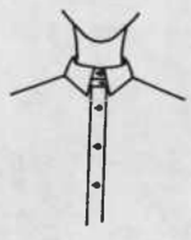 The shirt collar is a two piece high stand collar. It is often referred to as a band and collar. 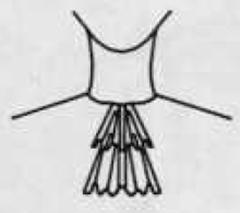 The ends of the collar may be square, rounded, or pointed. Variations include the button-down collar, pin collar, tab collar, spread collar, Barrymore collar, and the Swallow-tailed collar. 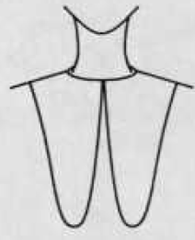 Low stand collars have concave neckline shapes. They are also referred to as flat collars. 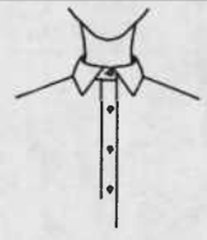 A Bermuda collar is a narrower collar with squared ends at center front. A bertha collar is a wide rounded collar extending from neckline to shoulder. 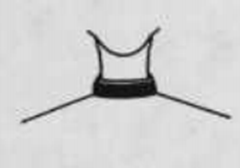 The opening of the collar may be at the front or back. 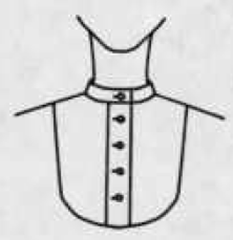 A bishop collar is a large round collar with squared front edges that extend downward. A butterfly collar is an extremely large collar that extends to the shoulders. The front hangs down in two points almost to the waist. A cape collar is a large circular collar that extends over the shoulders. 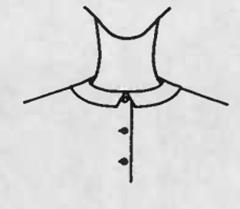 A choir-boy collar is a medium-sized collar with rounded ends at center front. 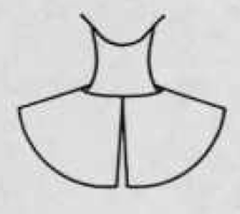 A Peter Pan collar is a narrow collar with rounded ends at center front. 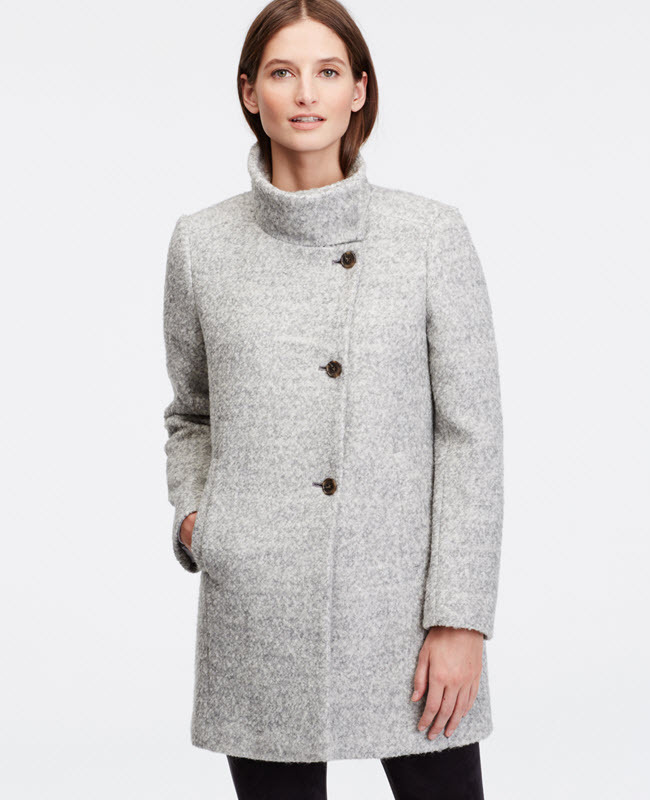 A pilgrim collar is a wide rounded collar that extends to the shoulders with pointed ends at center front. A platter collar is a medium-sized collar with large rounded ends in front. They are also sometimes called dog’s ear collars. 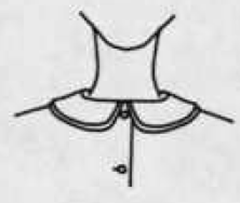 A Puritan collar is a wide collar extending to the shoulders with squared corners at center front and out edges. 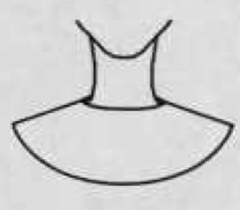 A sailor collar is square in back and tapers to a V in the front. Variations include braid trim around the edges and a dickey or inset in the V. They are also referred to as middy or nautical collars. 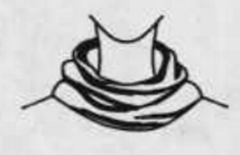 Shawl collars are formed by an extension of the garment front. They may be high stand, low stand, or band collar types. The collar must be seamed at center back. A shawl collar is a collar formed by an extension of the facing and garment front (undercollar). 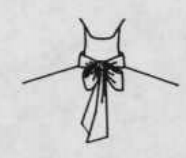 A Tuxedo collar is a variation of the shawl collar that continues the length of the garment from the opening. 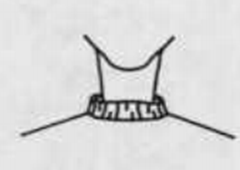 A bib collar has a flat rounded, square, or oval shape fitting around the neck like a child’s bib. 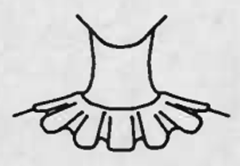 A cascade collar has a circular-cut ruffle attached to the neckline at center front of the garment. 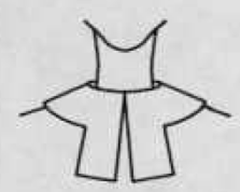 A circular ruffle collar has edging made from circular pieces of fabric. 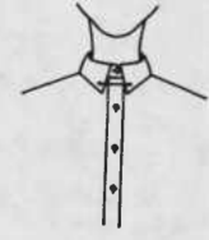 A double collar are two collars of the same shape, the upper collar smaller to show the lower collar. 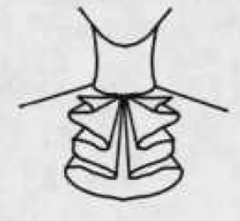 A Jabot collar has one or more straight ruffles attached to the neckline at center front. 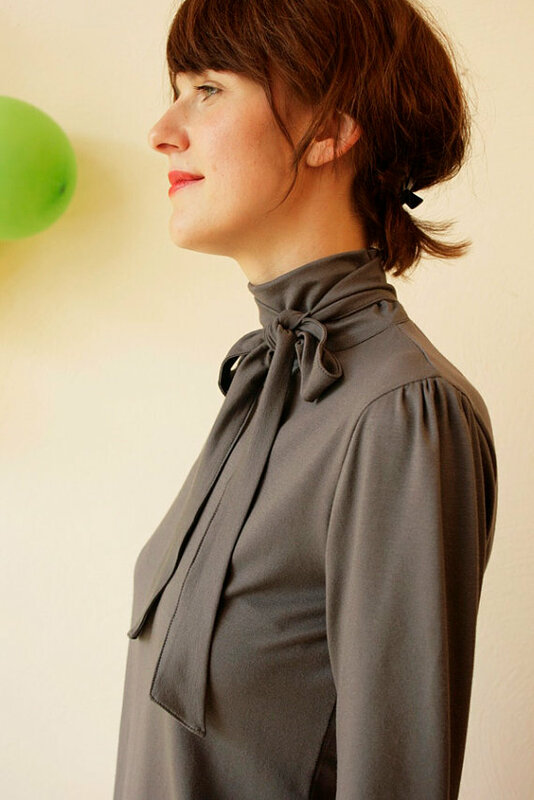 A Pierrot collar is a straight ruffled collar that lays on top of the shoulders. It usually has two rows of ruffles. A straight ruffle collar is a straight piece of fabric, lace, or trim gathered to the neck edge to form ripples.